Within every malignant tumor, there can be thousands of genetically distinct cell populations. The deadliest may be those cells whose genes allow them to metastasize. 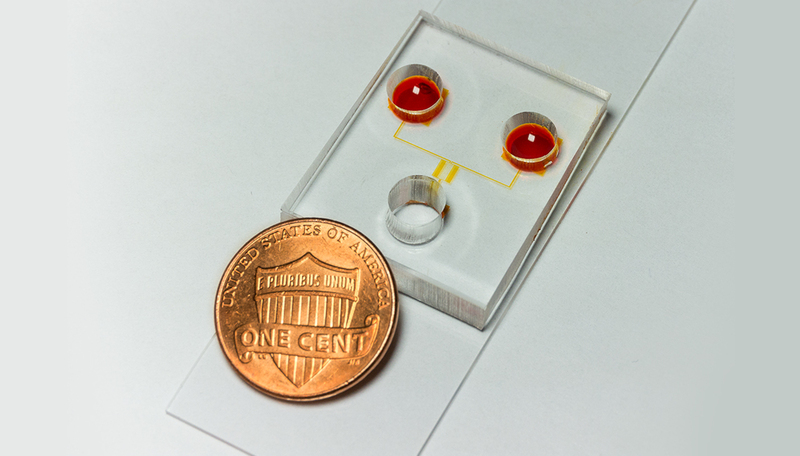 Now, a tiny chip, created through a collaboration of U-M Comprehensive Cancer Center and Department of Electrical Engineering and Computer Science researchers, makes it possible to isolate and study individual metastatic cells. The device may lead to a novel treatment approach that targets metastatic cells with precise, personalized chemotherapy. “These are the cells, even if they’re uncommon and rare in a cancer, that we need to be killing,” says oncologist and co-lead author Sofia Merajver (M.D. 1987, Residency 1991, Fellowship 1993), Ph.D., professor of internal medicine and of epidemiology. Euisik Yoon, Ph.D., professor of electrical engineering and computer science, of biomedical engineering and director of the Lurie Nanofabrication Facility, and his group developed a microfluidic device that handles tiny amounts of liquid to sort cancer cells based on their motility or ability to move spontaneously. The device consists of a polymer bonded to a slide. Its mazelike design allows a group of cells to sort themselves into a starting lineup then migrate across a set of tight parallel tunnels whose narrowness mimics that of the lymphatic vessels that metastatic cells have to travel through. Due to genetic heterogeneity, some cells cross faster. Those cells can be removed selectively from the chip and their mutations studied. With the speedy cells isolated and their secrets revealed, future researchers could try targeted drugs on them before treating a patient with a regimen tailored to that patient’s particular metastatic cells. Merajver says this fast, affordable and reproducible approach to cancer treatment could become a reality within five years, perhaps allowing patients to live well for years despite an active tumor. Merajver, who is scientific director of the Breast Cancer Program at the U-M Comprehensive Cancer Center, also holds a Ph.D. in theoretical physics. For his part, Yoon, though trained in electrical engineering, long ago grew fascinated by the revolution in biological research and looked for ways to contribute. His lab explores applications of microfluidic systems as well as neural interfaces, and he and his engineers stay current in biology. “We try to understand the problem that oncology doctors and biologists try to answer then we [provide] a tool which can effectively assist with their discovery,” Yoon notes. Yoon’s postdoctoral fellow Yu-Chih Chen, Ph.D., the study’s first author, is co-sponsored by the Cancer Center under Max Wicha, M.D., the Madeline and Sidney Forbes Professor of Oncology, professor of internal medicine and founding director of the U-M Cancer Center. Collaboration, Merajver says, is the future.